Presenting, My Home Grace Villas - an address that is an oasis of calm, peace and magnificence in the hustle-bustle of the city, Kochi. Your home will now serve as a perfect getaway after a tiring day at work, as My Home Grace Villas ambiance will make you forget that you are in the heart of the city, Aluva. My Home Grace Villas is a large project spread over an area of 3.20 acres. 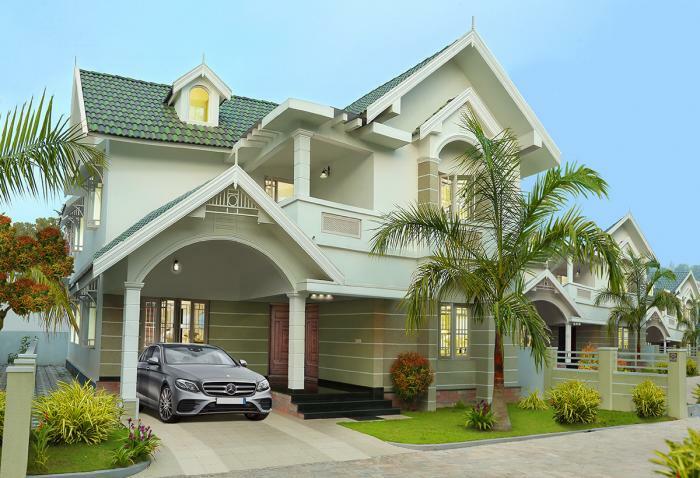 My Home Grace Villas comprises of 3 BHK and 4 BHK Villas in Kochi. My Home Grace Villas brings a lifestyle that befits Royalty with the batch of magnificent Villas at Aluva. These Residential Villas in Kochi offers limited edition luxury boutique houses that amazingly escapes the noise of the city center. My Home Grace Villas is built by a renowned name in construction business, My Home Villas & Apartment at Aluva, Kochi. The floor plan of My Home Grace Villas presents the most exciting and dynamic floor plans designed for a lavish lifestyle. The master plan of My Home Grace Villas offers people a strong connection to their surroundings, promoting a sense of community whilst balancing this with a distinct private address for individual homeowners. Amenities: Out of the many world class facilities, the major amenities in My Home Grace Villas includes Landscaped Garden, CCTV Cameras, Swimming Pool, Gymnasium, Play Area, Rain Water Harvesting, Club House, Badminton Court, Car Parking, Jogging Track, 24Hr Backup Electricity, Meditation Hall, Senior Citizen Park, Multi-purpose Hall and Security. Location Advantage: There are number of benefits of living in Villas with a good locality. The location of My Home Grace Villas makes sure that the home-seekers are choosing the right Villas for themselves. It is one of the most prestigious address of Kochi with many facilities and utilities nearby Aluva. Address: The complete address of My Home Grace Villas is Aluva, Kochi, Kerala, INDIA.. Started in 2000 and having its head office at Aluva, My Home has effortlessly achieved the brand status in building ideal homes in intelligent locations with innovative design, quality construction, perfect finish and timely delivery. Founded and nurtured by Mr K.P. Jose and Mrs Reshma Jose from their 15 years of rich and hands-on experience in the construction industry, our firm has its representation in everything related to real estate. Our firm always ensures the most peacefully located budget homes for all seasons. And, the most awaited recognition ISO 9001 - 2000 Certification, the ultimate verdict in quality, is on our doorstep. Our Senior Project Engineer: Shri I. Pathrose F.I.E: C. Eng. (Ind), Exe. Engineer ( Retd), Chartered Engineer (Civil), having more than 30 years of Engineering Service at Cochin Port Trust, a decade in private construction and a veteran in the intricacies of all construction methods, has now joined us for the new project 'The Periyar View'. Our Chief Architects: M/s. Mathew & Saira, the dedicated architect couple who designed the marvelous hotel 'Harbour View Residency' at Cochin and 'Little Flower Hospital' at Angamaly, are the architects of 'My Home'. Their expertise and dedication is very popular among the builders. Our Administrator: Mr. Domnic T.D, (M.A.English, ITI). Proper RCC/Random Rubble foundation for load bearing structure as per site conditions and with the opinion of soil expert/consultant, R.C.C belt, red brick/solid brick walls & R.C.C roofs. Rooms with excellent lighting & cross ventilation. Premium quality Vitrified tile flooring for the entire house except Bath rooms & Paving tiles for car porch. Granite kitchen counter, single bowl steel sink with tap. Glazed tiles up to a height of 2 feet above the kitchen counter. Ceramic tiles flooring & glazed tile (upto a height of 7 ft) walls. Wash basin & European closets. Chromium plated taps & shower fittings and provision for geyser (Only M.B. bath room), provision for exhaust fan. Teak wood front door, other doors in quality hard wood or molded doors, Enamel painted wooden windows with MS grills & glass. Putty finished plastic emulsion paint for internal walls. Weather shield emulsion for outside walls and enamel paint for doors and window grills. Melamine-polish for teak wood works. power supply with concealed wiring in PVC Conduits controlled by ELCB & MCB. Elegant modular switches. Provision for A/C in master bed room. Plumbing with high quality PVC pipes. KWA water supply with overhead water tank/ one common well with Water Tank. Points for cable TV & telephone. Shown in the website is indicative of how the unit can be used. Interior and furniture at extra cost. Ask from 1 other people who enquired about My Home Grace Villas. Review of My Home Grace Villas, Aluva? Its price, location, builder etc. Review of My Home Villas & Apartment, Aluva? construction quality, trustworthy, delivery history etc.? Review of My Home Grace Villas, Aluva location? neighbourhood, connectivity, schools etc.? Comparison of My Home Grace Villas, Aluva to nearby projects? Is it rightly priced? What is your feedback on this My Home Grace Villas, Aluva? Depends on brand name and complete the project in time etc? Will this be a better option for investment or to live in My Home Grace Villas, Aluva? Can you give some suggestion? Is the My Home Grace Villas, Aluva has more potential in terms of capital appreciation, ROI, Rentals, Proximity to social infrastructure etc?